While in the region the group met with approximately 450 sailors and military families. Among them were retired soldier and Granby High School swim coach Panos Makriyians, who brought along his daughter, Helen (age 17), to participate in the early morning clinic. While onsite the group led two informative swim clinics, where they shared warm-up techniques, offered helpful tips, participated in an array of drills and provided insight on what it is like to be on the USA Swimming National Team and perform in the Olympic Games. The group then journeyed outside the pool and participated in a USO meet & greet at the Norfolk Navy Exchange. Among the four athletes, Ervin shares perhaps the closest ties to the military. His father, Jack, served as a corporal in the Marine Corps during the Vietnam War. This is the first USO tour for Ervin and Phillips, and the second for Lochte and Clary, who visited to North Carolina in April 2014 and spent time with nearly 300 military families stationed at Camp Lejeune. 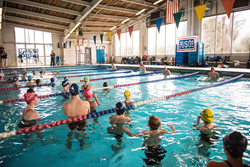 The USO appearance is part of USA Swimming’s Athlete Partnership Program. The program is a platform for National Team swimmers to encourage kids and adults to take up the sport as a healthy and positive activity. These appearances directly promote the sport and the healthy lifestyle it represents. To find more information about how to get started in the sport, visit SwimToday.org. The USO’s “Every Moment Counts” invites Americans to join the USO, in honoring and creating moments for our nation’s troops and their families this year. This tour, much like the campaign, centers around the countless every day moments – from family dinners and date nights to children’s births and milestone celebrations with loved ones that our troops and their families selflessly sacrifice due to their commitment and service to our country. To learn more visit USOmoments.org or join the conversation on Facebook or Twitter using #USOMoments. “I am extremely excited to have taken part in a USO Handshake Tour this past Friday in Virginia. The military does so much and gives up so much for this country that I am pleased to be there showing my appreciation. In addition to individual donors and corporate sponsors, the USO is supported by President’s Circle Partners: American Airlines, AT&T, BNSF Railway, Clark Construction Group, LLC, The Coca-Cola Company, Grand Canyon University, JCPenney, Jeep, Johnson & Johnson, Kroger, Northrop Grumman Corporation and TriWest Healthcare Alliance and Worldwide Strategic Partners: BAE Systems, BIC, The Boeing Company, ConAgra Foods, FedEx, Harris Teeter, Lockheed Martin, Microsoft Corporation, Procter & Gamble, TKS Telepost Kabel-Service Kaiserslautern GmbH & Co. KG and Wawa Inc. We are also supported through the United Way and Combined Federal Campaign (CFC-11381). To join us in this important mission, and to learn more about the USO, please visit uso.org. As the National Governing Body for the sport of swimming in the United States, USA Swimming is a 400,000-member service organization that promotes the culture of swimming by creating opportunities for swimmers and coaches of all backgrounds to participate and advance in the sport through clubs, events and education. Our membership is comprised of swimmers from the age group level to the Olympic Team, as well as coaches and volunteers. USA Swimming is responsible for selecting and training teams for international competition including the Olympic Games, and strives to serve the sport through its core objectives: Build the base, Promote the sport, Achieve competitive success. For more information, visit http://www.usaswimming.org.